The company plans to open 40 new chicken joints over the next 10 months. CHICKEN RESTAURANT KFC plans to open 40 new outlets across the UK and Ireland this year, creating 1,600 jobs. The expansion comes at the same time as a £40 million refurbishment plan for its existing 160 restaurants. The company says it wants to create a “more modern, welcoming environment” for diners. New developments include a click-and-collect app, equipment to keep food fresh for longer and cookers that use less oil. There are also plans to introduce new ‘lighter options’, an updated kids’ menu, new fries and high-quality coffee. 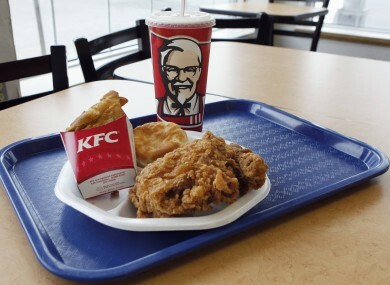 Last year, KFC opened 40 restaurants in the UK and Ireland, investing £40 million. According to a statement released today, the firm has recorded seven consecutive years of same-store-sales growth. “By opening new sites, improving the customer experience, introducing new technology and investing in our people, we’re confident that we will be well-placed to continue our upward trajectory,” said Martin Shuker, Managing Director, KFC UK & Ireland. About 24,000 people are employed by KFC globally. Email “KFC to create 1,600 jobs across the UK and Ireland”. Feedback on “KFC to create 1,600 jobs across the UK and Ireland”.